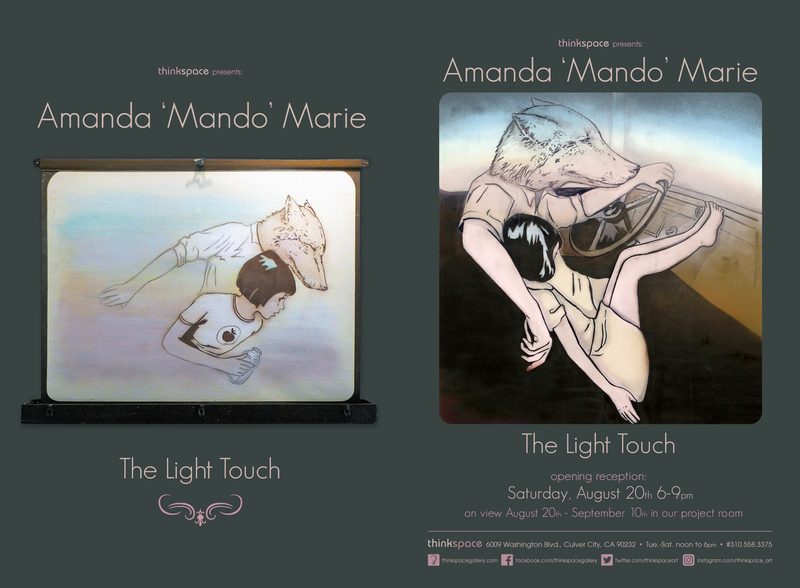 Amanda ‘Mando’ Marie’s latest body of work “The Light Touch” opens this weekend in Thinkspace Gallery’s project room. 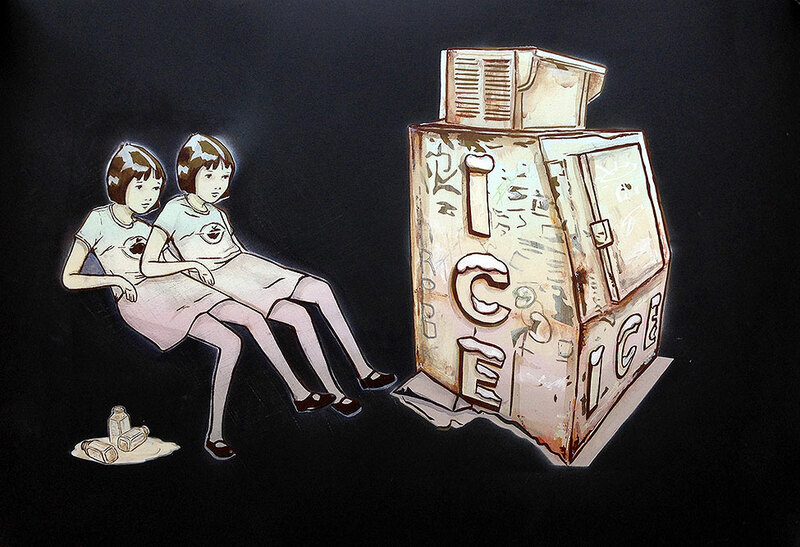 A collection of work that shows her signature golden-book illustration stencils and textured layers. 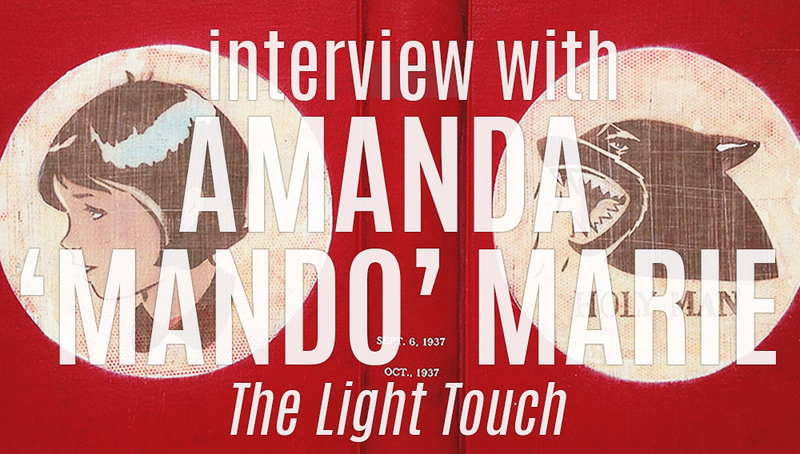 Our interview with Amanda ‘Mando’ Marie discusses her creative process and artistic path. SH: What is your favorite golden book children story? AM: I don’t necessarily have a favorite, but I do remember collecting tiny versions of Scuffy the Tugboat, The Saggy Baggy Elephant, The little Red Hen, and a bunch of other classics from Hardee’s kids meals. SH: How did you develop your artistic voice? AM: Mostly trial and error. Trying new things, seeing and finding visual techniques that I liked together. When I first started art school I would go buy the expensive paint and canvas. I met some friends who had a gallery in a warehouse called ‘the wheelbarrow’ in lodo Denver. I was working at a framing wholesaler at the time and the boys at the gallery had a bunch of rolls of old vinyl wallpaper. 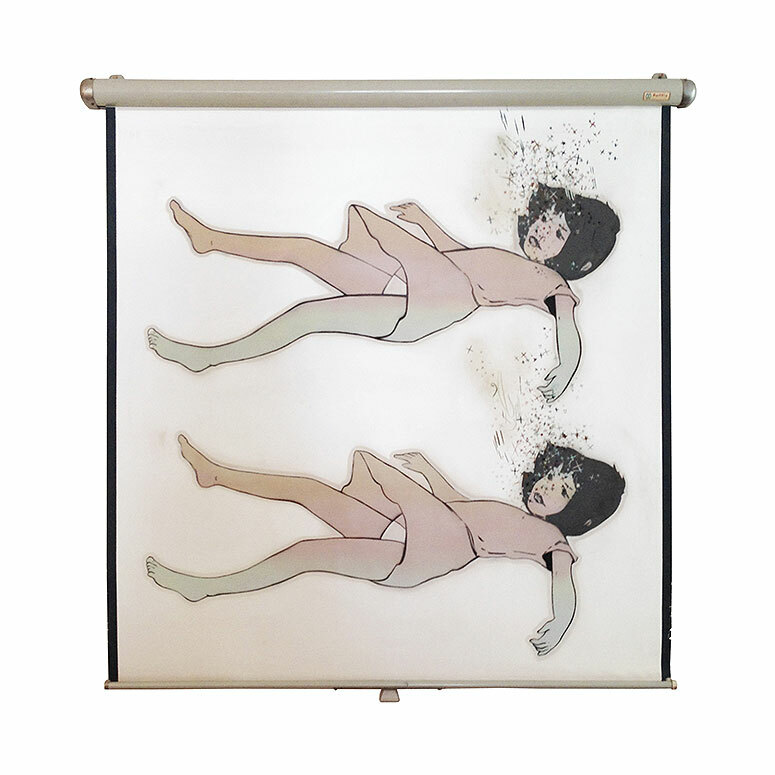 We started to take the frames that they were throwing away at the frame shop and stretching vinyl wallpaper over them. It gave us all as young kids who just wanted to make the opportunity to do so freely. We would have art shows and sell our work for dirt cheap. It was fun. SH: What made you explore stencils and the style you have today? AM: After ‘The Wheelbarrow’ split up Ryan went to Miami where he is now ‘Miami’s best graffiti guide’ and a forever amazing dude, my then boyfriend Calan and I moved into a basement studio of Andenken Gallery (which is now located in Amsterdam). We hung out with old and new friends in the scene, all interested in different mediums. They ended up teaching me way more than I ever learned at Art school. An old friend of Calan’s, but a new friend of mine, named Decker, rented one of the upstairs studios. He was a super chill snowboarder kid and was stenciling on everything. I decided to give stencil making a try. Later that year I was working at a pizza place down the Street Called Two Fisted Mario’s. I made one of the little girls and stenciled two of them for this tip jar that at the pizza place. My boss came by and loved it and asked if I wanted to show at his bar ‘Double Daughters’ next door. I got to work on making paintings with a lot of the characteristics that I’m still using. Hyland, the owner and curator for Andenken, came to my opening and also liked the work and asked if Calan and I would like to show in the basement of the gallery. The show went well and he offered me a solo up tairs. That show also got a lot of good reaction. I guess it was partly feeling like I was in a nice stride and partly the reaction from so many people enjoying the styles I was using that made it stick. AM: There is always a million things that inspire the work. I don’t always know what the story is until I paint it. The work is usually a reaction to life and all that is swirling around. 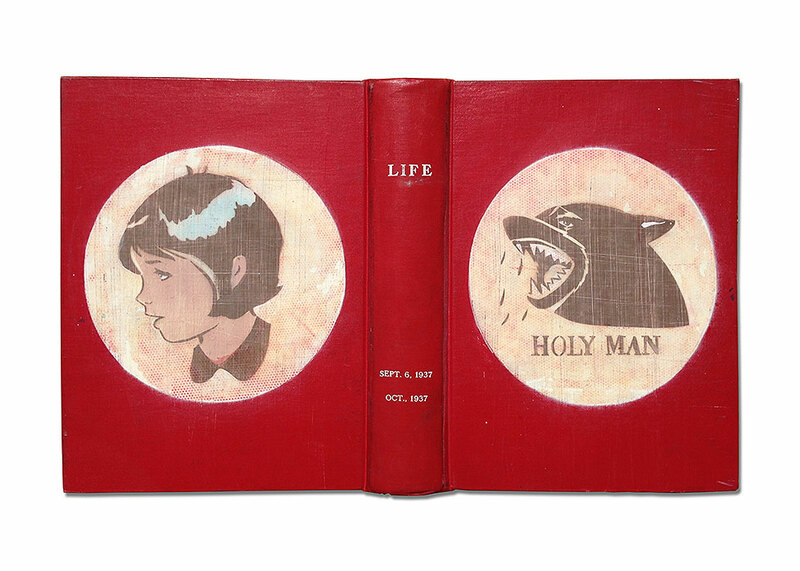 Life is so complex. SH: You’ve traveled a lot creating murals and for exhibitions, do you have a favorite city? Are your murals influenced by the location they are created? AM: Lots of favorites for sure. There is no lack of beautiful places in our world. I love almost every place I’ve been for one reason or another. There is a ton of the world I haven’t explored yet. But, influences do enter the work from traveling. The background color that I use on most of my murals is the dark green color that they use on most of the buildings in Amsterdam, which is the first place I left the country to visit for work. Portugal has beautiful patterns, Scandinavia uses color so well and has such a perfectly simple way of illustrating. SH: Some of your pieces have dozens of layers and other work more minimal, how do you know a piece is complete? AM: Instead of completely buffing old paintings that I wasn’t quite happy with I started to buff the parts I didn’t like instead, Then add more imagery on top of that and so on. Mess it up, try and fix it, mess it up, try and fix it, until finally, the mess became part of the solution. Though recently I have been getting more minimal. I just like the way the work looks with less texture sometimes. SH: What is your creative process? Is your studio messy, neat, or somewhere in between? AM: Both. I clean it up before I get started and when I finish, but the in between is a disaster. Usually, there are piles of stencils scattered all over the floor. It can be a problem. I end up spending a lot of time digging to try and find one that I used a day or week before, they get walked on and torn. Not the most efficient, but it works. SH: What do you do to push through self­doubt, a common problem amongst artists? AM: The root of why I make paintings is because I like to. Whether I’m putting them out there for other people’s eyeballs or not, ‘making’ would still be what I was doing. Also, I can’t and don’t expect to please everyone. It really isn’t a contest. SH: Your work has a very vintage post­ World War II style with a modern edge, is there something about that time period that holds some specific meaning to the work a part of style? AM: No Not really. It’s what I first found success with and I’ve been able to grow with this style. SH: If your work was used at the basis for an animated short, what would be the plot? Who would write the script or be cast as the lead voice? And what style of animation would it be? AM: A short film on something super practical like how to fix a flat tire on an old dutch bike, or how to pop popcorn over a flame. You know useful. I really like Alan Watts voice, he could read the script. I don’t know who I’d have write it, but someone with sarcasm and a sense of humor. SH: What’s the best advice you’ve received as an artist? What’s the best advice you can bestow for life? AM: ‘You don’t have to reinvent the wheel.’ has been something a friend told me and advice that I seem to continually need to remember. My advice would be to remember, it’s supposed to be fun. 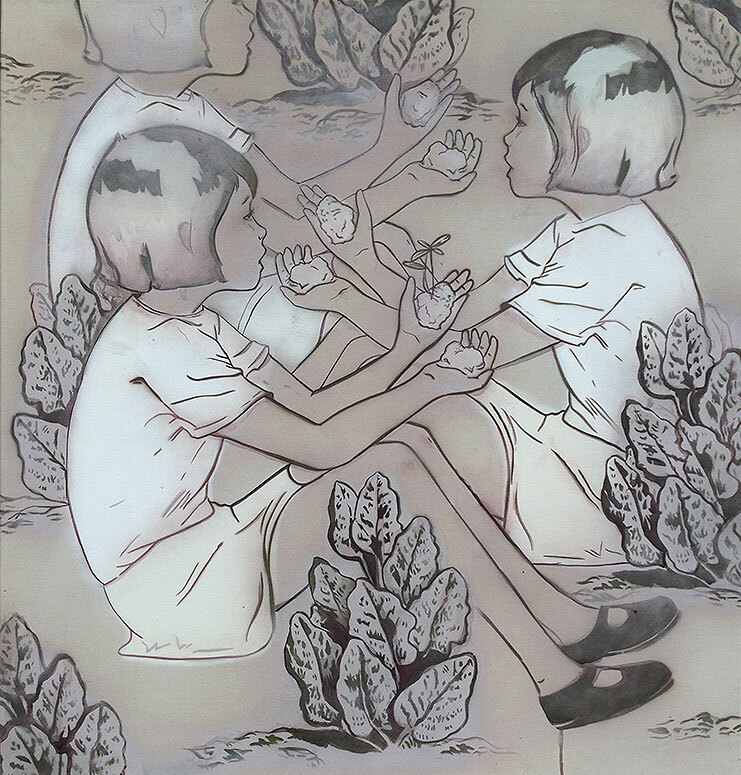 Join us for the opening reception of ‘The Light Touch‘ this Saturday, August 20th from 6-9pm. The exhibition will be on view through September 10th.